Act of Valor is a loosely fact-based story about real life Navy SEALs. The movie is different in that the actors are mostly active duty SEALs. Their names are not used in the credits and i'm sure the names they have in the movie aren't real to protect them and their families. So what do you say about a movie that's not really a movie? It started as a a military training video and grew from there. i got some passes to it a few weeks ago and was intrigued because i really had no idea what to expect. There are 2 SEAL Teams in the movie. this is why its so different, fictional story real SEALs. the only actors are the Roselyn Sanchez (from Criminal Minds) playing a undercover CIA agent who they must rescue when she's kidnapped and all the bad guys in the film. Thats it. Its a powerful movie for anyone who's unfamiliar about the life of a military family and those long deployments. Only 1 spouse is featured prominently and you can see how long the operations are taking because it begins with her bringing in the early stages of pregnancy, she's not even showing when he leaves, to the baby baby being a around 8 months at the end. I only know about long deployments 2nd hand. Favorite Uncle was int he navy for 20 years before he retired a few years ago, and my grandfather who died a few months after i was born was also retired Navy. i will admit it, it made me cry. 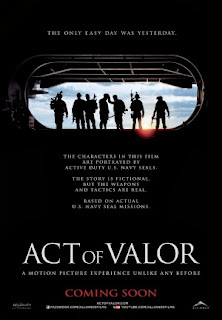 Act of Valor is rated R. its violent its a military movie you shouldn't expect anything less. I give it a Matinee. Again this isn't for everyone, some of you it might be better to wait till its on DVD and watch it in the comfort of your own home. Act of Valor opens today.